The medical information on this site is provided as an information resource only, and is not to be used or relied on soley for diagnostic or treatment purposes. This information is not intended to assist in the learning of medical students, pediatric residents, and general pediatricians. It should not be used as a substitute for professional diagnosis and treatment. 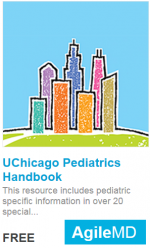 The University of Chicago & Comer Children's Hospital expressly disclaims responsibility, and shall have no liability, for any damages, loss, injury, or liability whatsoever suffered as a result of your reliance on the information contained in this site.